activity sheet including 7 video links + 8 pictures and caricatures + 10 posters to tackle the problem of road safety ! Hope you like it ! My students did ! 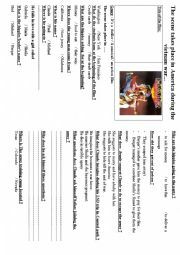 Worksheet about the film "Hair". Nice to tackle the hippy philosophy and the Vietnam war.